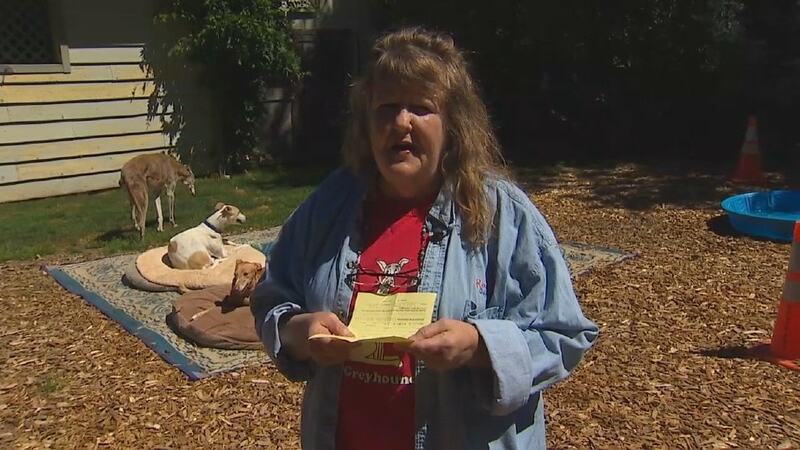 Kathy Isaksen of Tacoma, Washington is saying that she rescued a dog trapped in a hot car, and the local police department thanked her for her help by giving her a ticket for trespassing. Isaksen said that she has dedicated her life to rescuing dogs and knows a dog in need when she sees one. Believing that the dog she was seeing needed rescue, she just did what came naturally, she tried to help. The whole thing took place a St. Joseph Medical Center, and Isaksen managed to get the incident on video. In it you can hear her comment about how much the dog is panting, and how the poor creature just looked miserable. According to what she says later in the video, 911 had been called four times to have someone come out and see to the dog, but things were apparently not happening fast enough. A little while after that, hospital security comes out, but instead of trying to help the dog, they just dismiss the situation and try to assure Isaksen that everything is under control, and the dog is fine and not in any danger at all. After security left the immediate area, Isaksen decided to take matters into her own hands. She reached into the car, unlocked the door and let the dog out. Then she set out to find the dog’s humans, which didn’t take too long. In fact, once she delivered the dog to his humans, they seemed grateful for the help. The hospital wasn’t very grateful for her help however, and they issued her a ticket and advised her that she was not to step foot onto hospital property for one year. If she did, they would consider it trespassing and have her charged. This would have made visiting her sister, who is in St. Joseph’s, impossible. However, after talking things out, they hospital decided to drop the issue altogether, and she’s still allowed to visit her sister. That lady was a hero. Sounds like the State of Washington is need for some serious turnover in their government, right down to the local levels. That may get laws regarding animal abuse upgraded. Your senators and representatives aren’t doing enough. it looks like St. Joseph Medical Center security was pissed off with woman “non-compliance” to their assessment of the situation. the article stated that the pet’s owners were admit their mistake and grateful to the woman for rescuing the dog from hot car. so, the ticket should state the reason as “non-compliance” with the stupid decision and poor assessment of the situation rather than “trespassing”. medical hospital is PUBLIC faculty. i bet the parking spot did not have “no trespassing” sign. What a sad lady. Ever encounter a know it all who has to have everything their way? What’s next – it’s hot out and you dog is sleeping in his dog house and she gets the dog out and takes him away because she’s “rescuing” him? SMH. What a sad story of an opinionated neighbor sticking her opinions into where it isn’t needed. The dog was fine, the dog was safe, she didn’t rescue anything – she just caused trouble. so proudly stated by the person who most likely leaves their pet in a hot car too? Even with windows 1/2 down, when its 70 degrees out can reach to 115F after just one hour of time. it gets up to 100 after just 20 min. if it was 50 out and she was all “mightier than thou” perhaps you could be justified, until then, you’re not justified you’re just uninformed. do your research. You do know your temperatures are arbitrary and totally worthless right? It is dependent on the ambient temperature outside blah blah blah. Funny how I used to sit in a car just like this for hours on end waiting for my Dad to get off work so we could go home. I bet I treeat my dogs better than you do. I live in Texas and leave my dog in my car for brief minutes with the a/c running. I go into the store just long enough to pay for the gas I pumped…and STILL have morons like you try to tell me how bad an owner I am. Anonymous is another simpleton believing that animals are simply created to be thrown away when a person no longer wants the responsibility. I fully believe that people like Anonymous must be thrown away as they have no concept of humanity. spoken by a pet snake owner. 29 police dogs died from being left inside hot police cars last year and we’ve already seen more killed this year. Cops don’t even care about the dogs trained to save them why should they care about other people’s dogs. Holy crap? They let dogs that cost tens of thousands to train die in hot cars? What idiots!! If you are a callous a-hole and don’t love dogs, at least don’t waste taxpayer money. you donot hurt these babies,they give you all their love.I would stop someone from hurting a animal. She did nothing to warrant getting a ticket from the Hospital or anyone else. Anyone who leaves their animal in a parked card with the windows half-way or otherwise down should be subjected to the very same treatment. Leaving the windows partially down, whether or not it is in the shade is NO help. It is still hotter than the hinges of hell, and they should never be allowed to be an animal’s human. I am so tired of STUPID AND IGNORANT PEOPLE. I’m beginning to think that’s all there are! c) never ever take your dog anywhere and keep them penned in the yard for all its life. If you answered C, you clearly don’t deserve to have dogs. I take my dogs _everywhere_, and make it a point to take them to their favorite leash-free dog beach, which is 2.5 hours drive away. You can’t “hold-it” for 5 hours, and I use A method, just like in the story. Temperature doesn’t magically go up higher than air temperature when the windows are down and parked in shade. If you doubt this, measure it yourself. All these hysterical comments about dogs in car parked in shade with windows down are by dog abusers who’d never take their dog anywhere. I agree. It’s very very tiring to want to take your dog hiking or on vacation or anywhere else and fear some nutcase breaking my windows to “rescue” a dog that’s been in the car in the shade with the windows down as far as safe for 10 minutes while I pee. Too bad we can’t just squat in the grass like the dogs. I stopped for gas once, and was still filling the tank when a “lady” told me I shouldn’t leave the dogs locked in the car like that, they’d die.